Brigitte Bernard was born in Rouen (FR) and grew up in the Austrian Alps, moved back to France in 1956 and later on created a family there with her husband. 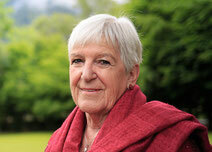 She is a mother of three children and a proud grandmother of five mokopuna. Her dedication to others and her research for inner and outer beauty led her on a healing path. She met and learned different therapies and got to know her spiritual master Shin. In 2008 she received a teacher's qualification from the school MIN-I.L.I.T., the Yoga of Integral Learning Intuitive Doing. Passionate about Haka, she puts her organizational competence and experience at the service of Grandmothers Healing Haka. Since 2015 she is part of the Association GMHH France today carrying the role of GMHH FR secretery.